The main virtue of the periodic table is that it provides the chemists and scientists from other fields a coherent and simplified organisation of the numerous elements. The periodic table of elements has become 150 years old in the year 2019. For so many years, it has endured as a scientific principle of organising elements in terms of their properties since it was published for the first time, and now the year 2019 has been declared as the international year of the periodic table by UNESCO. It was Dmitri Mendeleev, the Russian chemist who realised that the properties of the elements recur after every eighth element when they are placed in an increasing order of their atomic weights. This was the foundation of making the periodic table way back in 1869. For example, lithium is a soft and reactive metal. Exactly eight positions after lithium comes sodium in the table, and sodium does have the same properties as that of lithium. So is the case with potassium, which again comes after eight positions from sodium and so on and so forth. There had been other scientists also who were close to the discovery of this property of the elements, but for one reason or the other, they did not get much acknowledgement. The property of chemical periodicity was hinted first by a French engineer named Alexandre-Emile de Chancourtois. He designed a three-dimensional periodic system that he named the telluric screw. Then came John Newlands and William Odling, the London-based chemists who prepared their rudimentary periodic tables working independently. Danish Émigré, Gustav Hinrichs from the US, Julius Lothar Meyer of Germany, all realised that the elements could be organised with a coherent system. But, none of them could make the prediction of the new elements that might be discovered in the future. 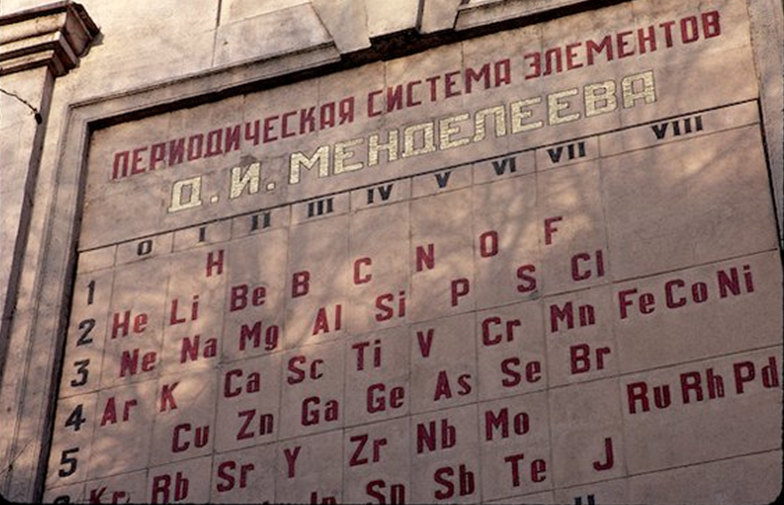 Mendeleev was the only scientist who could do this, and thus championed the value of the periodic table. The early 20th century brought a revolution in the field of physics and this came in the form of quantum physics. Scientists like Niels Bohr, Pauli, Schrodinger, and Heisenberg discovered that the properties of matter at the atomic scale could not be explained by classical mechanics, and to explain those, the classical laws needed to be replaced by new laws of quantum mechanics. Even in this situation, the periodic table and its ideas remained visibly unchallenged. There have been minor changes made in the periodic table, but these changes don’t change the basic character of the periodic table, and the basic idea based upon which it is designed. The important changes that are made are that the elements in the table are no longer ordered according to atomic weight—the total of protons and neutrons in the atoms’ nuclei, rather they are ordered according to the increasing values of the atomic numbers, that is the total numbers of protons and secondly, the original eight-column table is extended to a wider 18-column table. The main virtue of the periodic table is that it provides the chemists and scientists from other fields a coherent and simplified organisation of the numerous elements. Instead of learning the properties of each of the currently known 118 elements, scientists can get the hint regarding the properties of all the elements by knowing only the typical properties of just 10 of them. The periodicity of the properties of the elements arranged in the periodic table pertains to the arrangement of electrons in the atoms. It was found later, starting from the time of Rutherford—the father of atoms till the development of the idea of atomic orbitals. For example, the difference in chemical reactivity between elements depends on the number and spatial distribution of their electrons. If two atoms have electron patterns that are complimentary, then a chemical reaction can take place forming a molecule or a compound. The periodic table organises the elements depending upon their number and pattern of electrons, from which the reactivity of an element could be predicted. The periodic table is so powerful that chemists use it to predict the existence of still undiscovered elements. We can take the case of the compound YBa2Cu3O7 ­(Y stands for yttrium), which was discovered in 1990. It was found that it can behave as a superconductor at high temperatures. Chemists had to simply consult the periodic table for searching other such materials. In the periodic table, lanthanum lies just one place below yttrium, and hence compounds in which yttrium was replaced by lanthanum would also have super conducting properties. Later it was discovered that lanthanum-containing compounds were also superconductors. This was possible for Mendeleev’s vision of the periodic table. Mandeleev left several empty spaces in the table with the prediction that new elements would be discovered in the future that will fill up these spaces.